ASUS has taken to its official Facebook page to announce that its Nvidia Tegra 3 tablet will soon be updated to Android 4.0 Ice Cream Sandwich (ICS). The update will start rolling out on the 12th of January to the 10.1-inch quad-core ASUS Eee Pad Transformer Prime, making it the first Android tablet to officially receive Android ICS. We are sure this will put a smile on all the lucky Transformer Prime owners out there. Nevertheless, there has been a backlash from the developer community, as Transformer Prime owners discovered that the tablet’s bootloader is locked. ASUS explains that having a locked bootloader is a Google DRM (Digital Rights Management) requirement in order to allow users to rent videos. ASUS intends to provide an unlock utility. Use of the tool will void your warranty and make Google Video unavailable. By now you should be well briefed on the quad-core Tegra 3 powered 10.1-inch Android tablet by ASUS, also known as the Transformer Prime. We first looked at the keyboard dock-able tablet early this month and we know that it will hit retail channels in the coming weeks. You can actually pre-order it from Amazon.de for EUR 599. One lucky fellow managed to get his hands on a sample Transformer Prime and has shot a nice overview video of the tablet. The unofficial review starts the tablet on the keyboard dock and ends with an obligatory thickness comparison to the original ASUS Transformer and of course, the iPad 2. The Transformer Prime ships with Android Honeycomb on-board, but judging by the video already released by Nvidia, it won’t take long for it to be upgraded to Android 4.0 Ice Cream Sandwich. Video is after the break. 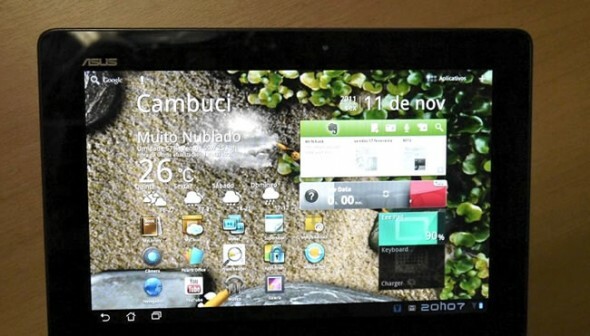 If you’ve been wondering how Android 4.0 Ice Cream Sandwich (ICS) looks like on a tablet, then wonder no more. 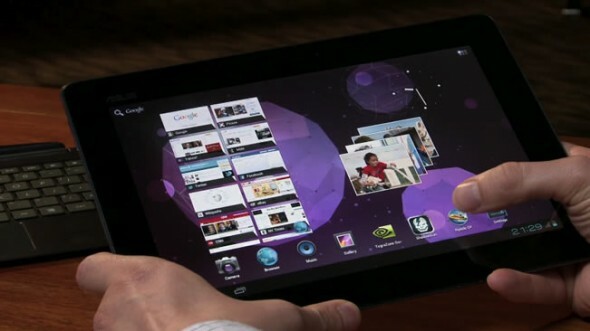 Once Google made the source code of ICS available, Nvidia and ASUS rushed to the challenge and got the new operating system working on the ASUS Transformer Prime tablet. As a reminder the Transformer Prime is the first device to run on Nvidia’s brand new quad-core Tegra 3 chip. We’ve covered the Tegra 3 here, and it’s an impressive piece of silicon, which promises not only awesome processing and graphics power, but also longer battery life through aggressive throttling and a frugal 500MHz companion fifth-core. We would easily guess that pairing such a chip with the latest and greatest version of Android would result in some smooth performance and now we’ve got the evidence to prove it. Nvidia has published a video of Android Ice Cream Sandwich running super smoothly on the Transformer Prime. If you would enjoy watching cool transitions, smooth 1080p playback and a demo of a quad-core optimized game called Riptide GP, head on after the break. 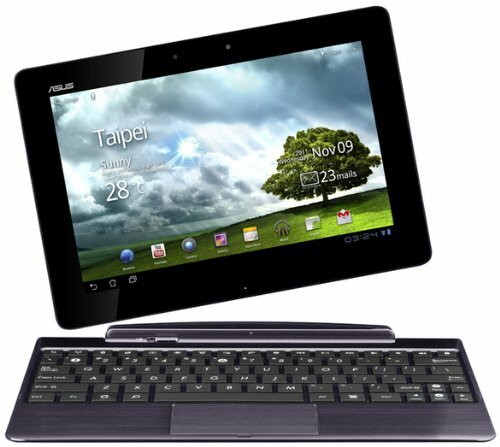 The Asus Eee Pad Transformer Prime 10.1-inch Android tablet is coming in December and it’s coming in hot. 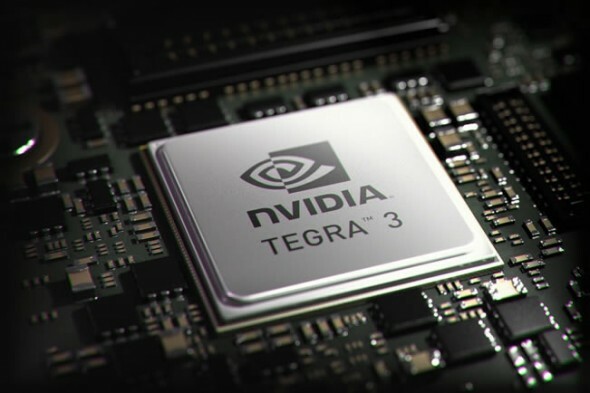 It will be the first mobile device to run on the quad-core (or should we say penta-core) Nvidia Tegra 3 chip. The Tegra 3 promises both amazing performance, with three times higher graphics performance than the Tegra 2, and as we’ve seen in our initial coverage, it will also offer better battery life, since it features a fifth low-power core which takes over automatically to reduce energy consumption. The Eee Pad Transformer Prime is set to debut for $499 in December, while a keyboard dock accessory will also be offered, essentially turning it into a ‘laptop’, hence the the transformer part. It will initially come with Android 3.2 Honeycomb but a promised Android 4.0 Ice Cream Sandwich update will soon be in the works. A Brazilian blog, Ztop, managed to get its hands on the tablet and has posted some first pictures of the Transformer Prime, showing off its thinness against an iPhone 4 and a Droid RARZ and getting friendly with the keyboard dock. There is also a hands-on video showing the tablet’s gaming abilities running the game Shadowgun; you’ll find it all after the break.